Robert S. Donovan combined his real-life work experience with knowledge from classroom instruction at Auburn University to develop a new tool aimed at improving productivity in the building science industry. Donovan left Auburn after his junior year for a career in industrial design but returned 15 years later and finish his degree. Auburn's Studio + Build program helped him turn his idea – The Tape Measure Anchor – into a finished, marketable product. The Studio + Build program, an initiative of the Center for Construction Innovation and Collaboration, solves real-world problems by bringing together industrial design students and faculty, building science students and faculty, end-user contractors and product manufacturers. The device is a clamp that has a rotating, slotted wheel. The movement allows the user to measure from the inside of a board, instead of the outside. Also, since the end of the tape measure rotates, multiple measurements can be taken from the same anchor point. Donovan built a prototype and gave it to builders to test. "They liked it so much that they wouldn't give it back," said Paul Holley, professor in the McWhorter School of Building Science and director of the Center for Construction Innovation and Collaboration. "They were previously measuring by hooking the tape measure over the back of perimeter formwork for concrete slabs or sidewalks. Not only is that unstable, but then you have to compensate for the thickness of the board in your dimensions." Auburn's Office of Innovation Advancement and Commercialization, which works alongside the Studio + Build program, worked with Donovan on connecting him with a company interested in licensing the product. 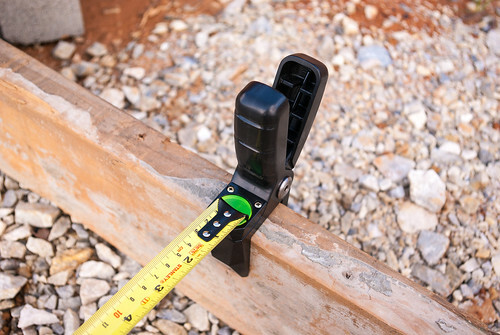 Surveys with potential customers in 2014 found an interest in the Tape Measure Anchor for purposes beyond concrete slab work, such as measuring off of a metal stud or doing fine concrete work that requires a radius to be defined for a curved surface. "Six months later a technology development company contacted us, and we were able to have an informed conversation with them based off this information our intern helped gather," said Brian Wright, associate director for commercialization within the Office of Innovation Advancement and Commercialization. "We were able to tell them, 'Here are the applications, here is who we think will buy it, and here's why.' That engaged them, and we were able to get a license agreement in a few months." The technology development company formed the Tape Measure Anchor company, which took the license to the patent. The patent was awarded in 2012. 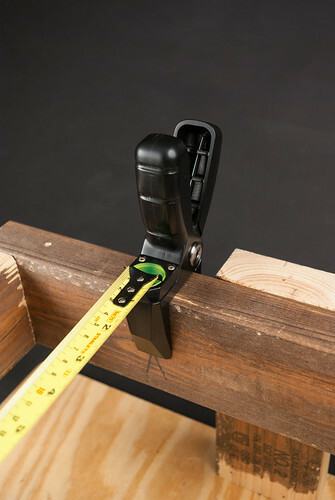 "One of the main competitive advantages is that, because we are patent-protected, no one else can have a tape measure anchor with this functionality that is anchored with a clamp," said Jason Pottinger, strategic advisor for the Tape Measure Anchor company. "Other advantages include its affordability and its practicality for not only professionals, but also the average do-it-yourselfer working alone at home." The company is looking at strategies for entering the market. One option would be to partner with an already established, well-known company to co-package the Tape Measure Anchor with their tape measures. Another option would be to find investors to help the company produce the anchor on its own and market it purely under the Tape Measure Anchor brand. Donovan credits teamwork and collaboration between academics and industry as the keys to a successful venture. He worked alongside Holley; Tsailu Liu, former Industrial Design faculty member, now at North Carolina State; and Steve Williams, professor emeritus from Building Science at Auburn. "Fundamentally, the thing that makes this a great process is the way the university is partnering between the industrial design department, the building science department and the industry to give students a real world insight into actual product challenges," Donovan said. "Not only are viable concepts developed, but there's an outlet through the Office of Innovation Advancement and Commercialization to actually try to sell those designs on the market." More information about the tape measure anchor can be found at www.tapemeasureanchor.com or by contacting Brian Wright at wrightb3@auburn.edu. More information about Studio + Build can be found at www.studiobuild.org.